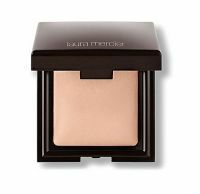 This reminded me of Becca's new powder in its slightly glowy, dewy finish. I think it's lovely. If you're going for a natural, lit-from-within glow, but if you have oily skin, it's probably a no-go. This looks really pretty with its candlelit glow. Perhaps not the best product to use if you have a super oily t-zone like I do. Pretty powder, just doesn't work too well with my skin. This is the prettiest powder. Normally I skip powder because it settles into fine lines and ages me, but this truly imparts such radiance to my skin -- the name candleglow is perfect.